Do critical omissions in Coyote Valley's environmental impact report represent oversight—or fraud? UNBEKNOWNST to most of us, Highway 101 is as much a bustling thoroughfare for furry wildlife as it is for humans zipping by in automobiles. Bobcats, raccoons, deer, skunks, coyotes, ground squirrel and even mountain lions regularly sneak under the freeway through minitunnels called culverts, generally meant for water drainage. In fact, a team of biology researchers from De Anza College recently discovered that these culverts—particularly along the stretch of Highway 101 that passes through Coyote Valley between San Jose and Morgan Hill—are part of a critical "wildlife corridor." However, you wouldn't know that from reading the Draft Environmental Impact Report for the Coyote Valley Specific Plan, which would fill the rural area with 26,000 homes for more than 70,000 people. It would create over 16 million square feet of commercial and industrial space and bring 50,000 new jobs. And the wildlife corridor is just one issue that critics say San Jose officials are glossing over in planning the massive development. What's more, the environmental consultants the city hired to study the potential impacts of urbanizing Coyote Valley could be part of a much bigger problem with San Jose's process of preparing environmental documents. When it was released in the spring, the DEIR for the Coyote Valley Specific Plan received over 1,000 pages of critical response from 28 public agencies and 55 organizations and individuals. Some of the most scathing comments referred to the report as "a terrible, flaw-ridden document" prepared with "an abysmal level of analysis." The United States Fish and Wildlife Service wrote: "The DEIR is inadequate, and should be revised, due to factual errors, omission of impacts, inadequate analysis of impacts, faulty assumptions and conclusions, inappropriate or missing mitigation, inadequate scientific data." 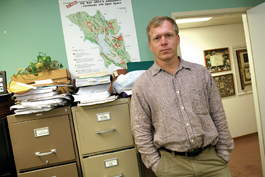 Several environmental groups, including the Sierra Club's Loma Prieta chapter, admonished the consultants for their lack of on-site data collection. They declared the study incomplete because researchers only accessed 60 percent of the land and made some conclusions with "drive-by" observations from inside their vehicles. Tanya Diamond, a biologist who helped supervise the De Anza study, says the DEIR understated the significance of the wildlife corridor by assuming that Highway 101 was a major barrier for animals to cross. Her field study proved that assumption wrong. Critical information would have been missing from the DEIR if it weren't for groups like the De Anza team, which monitored the area weekly. "They certainly didn't spend enough time out there," Diamond says about the consultants. "I would love to know why that happened. Was it just negligence?" David J. Powers and Associates, the lead consulting firm that wrote the DEIR with the help of 10 subconsultants, declined to comment for this article. City officials have since retracted the DEIR and plan to rewrite it by 2009, which could cost developers another $1 million. However, San Jose planning director Joe Horwedel says he wasn't alarmed or even surprised by the volume of comments the DEIR received. "It's a huge project of statewide significance," says Horwedel. "We think the process worked the way it should have." Critics, however, say they saw enough problems with the consultants' methods and explanations to question San Jose's larger planning system. Every year the city works with consultants on some kind of environmental analysis for 50–100 development proposals. The scientific experts examine all of the environmental factors that could be affected by a project: toxins, traffic, endangered species, water quality and cultural artifacts, to name a few. The thing is, the science of predicting environmental impacts that haven't actually happened yet is highly interpretive. "A lot of areas in EIRs are fuzzy," says Gary Binger, urban planning professor at the University of California at Berkeley. "There's a lot of subjectivity." That's why many public agencies choose their environmental consultants carefully in order to minimize the potential for bias. Prior to 1996, developers wanting projects approved by Santa Clara County could hire a consultant directly and submit the results of the study with their application. "How can there be bias when that happens?" county Planner Rob Eastwood points out sarcastically. "No, just kidding." Then-county Supervisor Joe Simitian changed the practice in 1996 in order to avoid conflict of interest and public criticism. Now county officials stick to a list of environmental consultants that are screened with questions like: "During the preparation of a Draft EIR, how would you respond if a project proponent directly pressures you to change a conclusion, minimize an impact, or otherwise influence the findings of the EIR?" Many other cities and counties in the Bay Area follow a similar process: they hire consultants directly so the paychecks come from the public agency (although the money gets reimbursed by project applicants). The developers also have little or no input in choosing the consultant. Of the eight cities Metro surveyed in Santa Clara County, San Jose was the only one that allowed developers to contract with consultants directly, essentially giving them the freedom to pick whomever they wanted to conduct the environmental studies. Cupertino, Los Altos, Santa Clara and Sunnyvale allow developers to suggest the names of consultants they prefer to work with, although the decision is ultimately up to the city officials. Campbell, Gilroy and Mountain View, like the county, have more stringent policies: they don't even allow the applicants to propose the name of a company they prefer. Several of the city planners we spoke with were very clear about discouraging communication between developers and consultants. "The goal is to have the most objective information possible," says Sunnyvale spokesman Adam Levermore Rich. "People don't intentionally misrepresent things," explains county planner Michael Lopez, "but if I'm paying you to prepare something for me, I can't help but think you're going to try to please me." Technically, San Jose's process isn't illegal; it's one of several arrangements allowed by the California Environmental Quality Act (CEQA). San Jose Planner Akoni Danielsen says the city takes full responsibility for the quality of environmental reports. "My goal at the end of the day is to have a document that everyone can agree is accurate," he says. He says the environmental consultants' opinions "aren't for sale, regardless of who's paying them." Only five firms, which Danielsen believes are reputable, produced the 41 EIRs that San Jose approved in the past three years. David J. Powers and Associates, the same consultants who took on the Coyote Valley DEIR, have also been hired by Gilroy, Cupertino and Santa Clara; they're even on Santa Clara County's "A list." "The biggest challenge we have is that, at the end of the day, the applicant [developer] does have to have some confidence in the consultant that's doing the work," Horwedel explains. But environmentalists say they have far less confidence in consultants chosen by the very people who stand to gain from a favorable report. "It's not in the developer's interest to get the type of people that will go out and do a really good job," says Brian Schmidt, advocate with the Committee for Green Foothills, "The more work you do, the more you'll find the impacts." David J. Powers and Associates, along with seven of their subconsultants, were all paid directly by Coyote Housing Group (CHG) for initial environmental studies between 2003 and 2005. Then city officials decided to make a strange exception to their usual EIR preparation process: they hired the Coyote Valley consultants directly, but didn't put out a competitive bidding process for other companies to apply for the project. San Jose leaders approved a rollover of the same companies that had been previously hired by CHG because they were already familiar with the project. The companies were also already familiar with the developers involved, although that didn't seem to bother planning director Horwedel when he forbade communication with CHG.
"I personally sat in a room with every one of the consultants and said, 'I will fire you from the job if I find you having these conversations; they will not be tolerated," Horwedel says. He wouldn't specify what kinds of conversations were forbidden. "We wanted to make sure there was a firewall," he adds, "We've tried to be very deliberate about maintaining a separation." But if "separation" is so crucial in planning for Coyote Valley, why hire the same consultants that had been on the developer's payroll? And more importantly, why isn't the same "firewall" applied to all development projects? Danielsen says he's very confident in San Jose's process and thinks city officials altered it for Coyote Valley in order to make a better "public perception." But for the De Anza team that spent five months tracking droppings and pawprints in Coyote Valley, it's about results, not perception. While monitoring seven of the area's 24 culverts with video cameras, they recorded over 400 signs of wildlife. "The animals wouldn't be able to get through anymore," says Diamond about the proposed development. "If it were just a couple of buildings, I don't think we'd worry so much." Research intern Dina Baslan contributed to this story.